Leupold 66195 Rifleman QDManager 3-9x40mm RBR Riflescope FREE SHIPPING! have many spotting & gun scopes to choose from. Bring home a buck and support the environment with the Rifleman QDManager 3-9x40mm RBR Riflescope from Leupold. With every scope purchased a portion of the proceeds will be donated to the Quality Deer Management Association to aid in the development and implementation of conservation based programs. The scope itself features precision fully coated lenses with an adjustable objective zoom to ensure ideal sight picture in any environment. The lenses ensure maximum light transference so that ambient rays can be converted into a crystal clear sight picture even in lowlight conditions. A tough aluminum body is made to handle the roughest woods while O-ring seals and a nitrogen purged tube ensure that rain, humidity and moisture will not affect your ability to pull of the perfect shot. 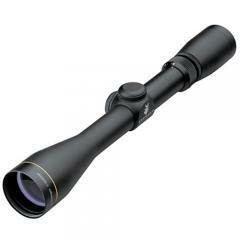 ©2002-2019 CopsPlus.com: Leupold 66195 Rifleman QDManager 3-9x40mm RBR Riflescope FREE SHIPPING!